Vessel by Sarah Beth Durst. Margaret K. McElderry, 2012. Currently Available. Face Value: I respect this cover. While it doesn’t necessarily scream to me from bookstore shelves, once I was reading the book I found myself totally drawn to it. The girl looks like Liyana is described, right down to the clothing and it hints at the story without giving anything away. Does it Break the Slate? YES, definitely yes. This book is Slate-shattering on a couple of different levels. First, we have a whole host of fascinating, powerful female characters, starting with our indomitable heroine Liyana, including the totally different vessels Raan and Pia and even the goddess Bayla all give us different amazing women to appreciate. But even the bigger ideas of the book, about identity and faith and what we deserve are Slatebreaking ideals that are given serious thought in this book, challenging the reader to think about these big issues from multiple perspectives. Who would we give it to? Any fantasy lovers with series-fatigue, longing for a really good stand-alone piece of storytelling, this is the book for you. The rich world-building and honest characterizations will appeal to both serious fantasy readers and fans of contemporary realism. Review: Sarah Beth Durst creates a fantasy world for us in the desert, where desert clans are dependent on the help of their gods and goddesses for survival. Each generation, a vessel is chosen, who will be trained until the cusp of adulthood, when he or she will participate in a ceremony that allows the god or goddess to take over his or her body. The vessel’s soul then goes to the Dreaming (they die), but the use of the body allows the gods and goddess to help each clan through difficult times. It is an honor to be chosen, and Liyana of the Goat clan has been preparing to be goddess Bayla’s vessel since childhood. But during the ceremony, Bayla does not come. Afraid of the goddess’s anger, her clan abandons her in the dessert, and Liyana expects to die. But then Korbyn, a trickster god inside of his vessel arrives with news. 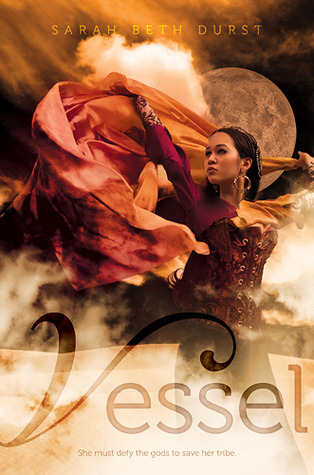 Deities are being trapped in false vessels and he needs Liyana’s help to rescue them. The real reason to read this book is the incredible quality of the storytelling. The language is beautiful, the world is impeccably drawn, and the plot is really original. I adore retellings, but it’s really refreshing to read a fantasy that isn’t reshaping another tale, but creating it’s own kind of mythology. But to focus all on the language and the plotting would do a disservice to how well crafted the characters are. Liyana is a fantastic Slatebreaking protagonist, both impossibly human and deeply heroic. Korbyn is a fascinatingly complex character, a trickster god suddenly tasked with saving the fate of his people. The other abandoned vessels, as we come across them one by one all add a profound layer of understanding to what it means to sacrifice yourself for your faith and your people, and shape the story in a beautiful way. These questions of identity, duty, and sacrifice are, obviously, embedded throughout this novel, and Durst does a great job of presenting a lot of points of view. It’s one thing for these characters to have prepared for this sacrifice, and to know that is their role, but once things chance, and the deities do not come, what does it mean for them to continue to live their lives? Some of them, like Pia of the Silk Clan, find certainty in their faith and purpose, shaken to the core by the idea of not fulfilling her purpose as a vessel. Others like Raan of the Scorpion Clan are furious at the idea of sacrificing her own life to a god. For all of them, their sense of the world is transformed when the deities do not arrive, and their purpose as vessels is changed by the journey of rescue. In looking at this book from a Slatebreaking point of view, from this idea of taking your life into your own hands, it’s fascinating to think of how that shifts when you’re balancing your own needs and your duty to the people you love. Some sense of compromise needs to be reached, and, without ruining anything, the resolution is satisfying on both character and plot terms. My only (small, really) disappointment was the character of the Emperor. He served his purpose, but I wanted to know more about him, and to understand more about why he was worthy of us ultimate role in the resolution. But in the larger picture of this incredible story, it is a small question. This entry was posted in Reviews, Young Adult and tagged Fantasy, Mythology, Standalone. Bookmark the permalink.